I can't find the right Category for my wack. What to do? The Wacktrap site is based upon literally thousands upon thousands of hours of research, development and work. We’ve compiled many of the most frequent wacks in life, categorized by what our Team currently knows to be the most common areas for experiences. But we’ll be the first to admit, you can’t always know exactly where or when a wack’s gonna pop up. While we’re sure we’ve gotten (at least most of it) right, we need your help. 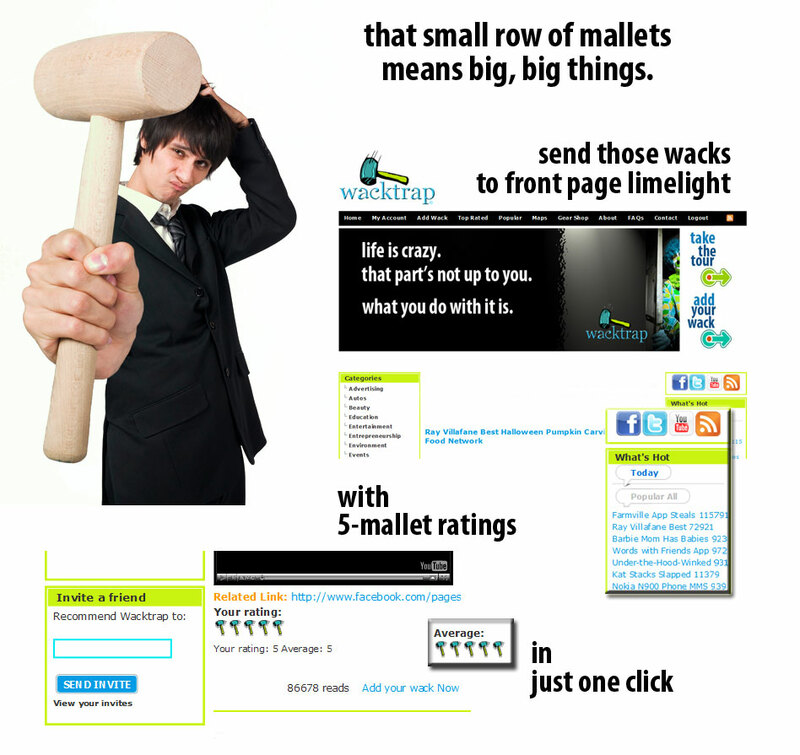 Wacktrap depends on your insight and experience. We need your wack sightings. If you need to post your wack but aren’t seeing a category that best applies to you, we need to hear from you. Suggest a Wacktrap Category now via our webform, and we promise-we’ll work as fast as we can-to get it into our site structure. We'll have you back up and wacking-in no time. The answer to my question isn't listed. How do I contact Wacktrap? I've got feedback. How do I contact Wacktrap? Even as we speak, you’re determining how the Wacktrap site works, what features are offered, and what needs to be changed. Wacktrap categories? They’re based, and change, according to you. So what if you’ve got something to tell us? Like what you think. Or what we can improve. Or the category you’re sure we need most. To make your experience better, better, and best, we need to hear from you. Can I contact Wacktrap about advertising with my company? Please never solicit Wacktrap for ad placements, or attempt to solicit Wacktrap, in hopes that Wacktrap will be choosing to place an advertisement with your company or business. Doing so will only waste our time and yours. How long will it take Wacktrap to answer my question? Our Wacktrap Team is dedicated to answering questions and concerns concisely, precisely, and as fast as possible. We know, ‘soon’ never feels soon enough when you’re excited to get goin’. We understand. But we promise, we’re workin’ on it.